I’ve blogged before about what I consider to be the pinnacle of brownie perfection – the Tribute to Katharine Hepburn brownies (aka Namesake brownies) from Dorrie Greenspan’s book Baking: From my home to yours. But I believe I have found a strong contender for Ms Greenspan’s crown, in the form of these – Chocolate Truffle Brownies from the Popina Book of Baking (currently under a tenner at Amazon and highly recommended). Featuring an impressive near quarter kilo of dark chocolate, these taste incredible – gooey, rich, unbelievably chocolatey – with the melt-in-the-mouth texture of the finest chocolate truffles. The recipe is also dead simple, as long as you don’t rush melting the chocolate and butter, and remember to take the eggs out of the fridge an hour or two beforehand. As is my wont, I bunged in a bit of espresso powder to increase the intensity of the chocolateyness. 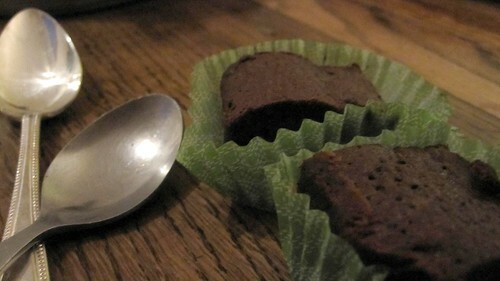 I cut them into 25 little squares and served them in cupcake cases, as they’re quite squidgy. I also kept them in the fridge overnight to firm up. Get your eggs and butter out of the fridge and go and do something else for a bit. Preheat the oven to 150C (300F, gas 2). Line an 18x18cm square pan with greaseproof or a re-usable baking liner. Melt 240g dark chcolate (I used Lindt 70% cocoa) with 100g butter in a bowl over a saucepan of simmering water. Take this bit slowly – avoid keeping the heat on the saucepan all the time. You could probably do it in the microwave too. Stir until melted, and leave to cool down a bit. Crack 3 eggs into a mixing bowl, and whisk in 135g caster sugar with an electric whisk until pale and creamy. Or use a hand whisk and firm muscles. Fold in 55g plain flour, and 1 and a half teaspoons of espresso coffee powder. Fold in the choc/butter mixture carefully. Pour it into the tin. Lick the bowl and spoon. Into the over. The book suggests 15mins, but mine were still very wobbly in the middle, so I gave them 5 mins longer. Avoid over-cooking though. Nobody likes an overcooked brownie. Leave to cool completely in the tin. I left mine in the fridge once they’d cooled to room temperature before slicing them up. You could dust them with cocoa powder before slicing, for an extra choc hit. Makes 1 enormous greedy slab, 9 coronary-inducing size, 16 or 25 bite-sized. 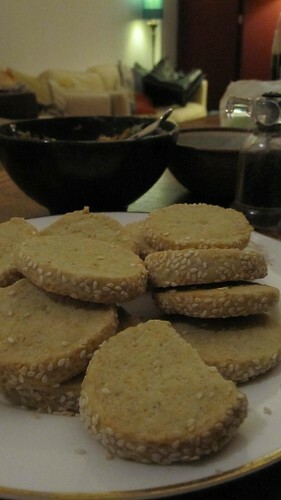 I also took along some stilton biscuits, from the same book. They’re billed as stilton and celery, but I didn’t have any celery salt, so they’re plain old stilton. These didn’t go down so well at the party, although they were delicious, because I think people were a bit confused (or maybe drunk) to discover they were savoury rather than sweet. And I may have added too much salt. Hmmm. They were really yummy though. Perhaps people were just chocolated out. Bung 140g plain flour, 60g chilled butter (cubed), 85g crumbled stilton, 1/2 tp salt and 1/2 tsp bicarbonate of soda in a food processor. Process into crumbs. Add about 2 tsps water an pulse until the mixture forms a dough. I had to add quite a bit more water to achieve this – more like 2 tablespoons, so I suspect there’s a typo in the book. Squidge the dough into a cylinder about 3 cm in diameter. Sprinkle abour 2 tablespoons of sesame seeds onto a plate, and roll the cylinder on the seeds, pressing them into it. Wrap the dough in clingfilm and put it in the fridge for a couple of hours. Get the dough out of the fridge and slice it up – roughly 1 cm thick. The recipe says this will make about 30-40, but I didn’t even get 20 biscuits out of it. They were quite big though – I clearly can’t judge a diameter of 3cm. Put the slices on a baking tray lined with a baking liner. They’ll spread a bit, but not much. Bake for 20 mins until golden. Cool on a wire rack, then store in an airtight tin. PS – what do you think about my attempts at more arty photography? This is a slightly differen recipe from the one I made with you – but it’s probably even tastier! Good luck, let me know how it goes. needed to bake brownies. have found a similar one but will give this a go. As i need to make gluten free cakes brownine recipes with lots of chocolate and not much flour are perfect. photos good. top one in particular. Flo: Good luck with them – I don’t know if they would work with gluten-free flour but worth a try! Emily: You can never try enough brownie recipes, in my opinion! I am trying to minimise use of processed ingredients. Can I omit the coffee powder?